Torpedo levels, I-beam levels, combination square, carpenter square. Vials read plumb, level, and 45˚. Available with or without a magnetic edge. Top reading window and a V-grooved working edge for pipe work. The vials read plumb, level, and 45˚. Strong holding magnetic edge frees hands. 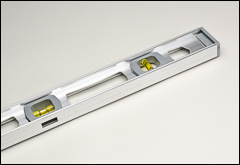 Rugged I-beam aluminum level with a top reading window. The beveled end plates protect from shock. Vials read 2 plumb and 1 level. 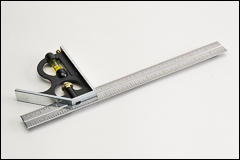 Used for accurate 90˚ and 45˚ markings, for measuring, and checking depth. 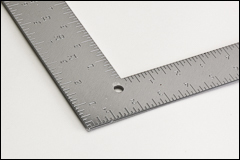 Steel blade includes 1/8", 1/16", and 1/32" graduations. Includes hardened scriber and a machined head with full view acrylic vial. Steel square with a buffed and lacquered finish. Body dimensions are 24" x 2" with a 16" x 1 1/2" tongue. 1/8" embossed graduations and figures on both of the front and back side. Reverse reading scale also on both sides of the square.